In Habitat, we are introduced to the fractured society of the spacefaring Euhumanists (Eu- being the greek prefix meaning pure or true). 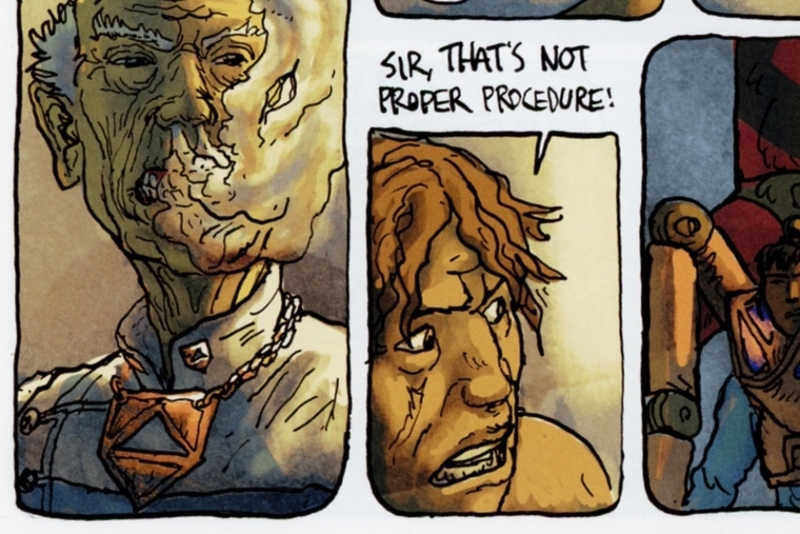 As explained by the comic’s creator Simon Roy, this radically anti-posthuman society rejected all beings who didn't inhabit a mortal, biological body as being non-human, and as we learn in the story, their defiance prompts “the uploads” to send one of their own to punish the Euhumanists. The confrontation with the posthuman critically disrupts many of the E.V. 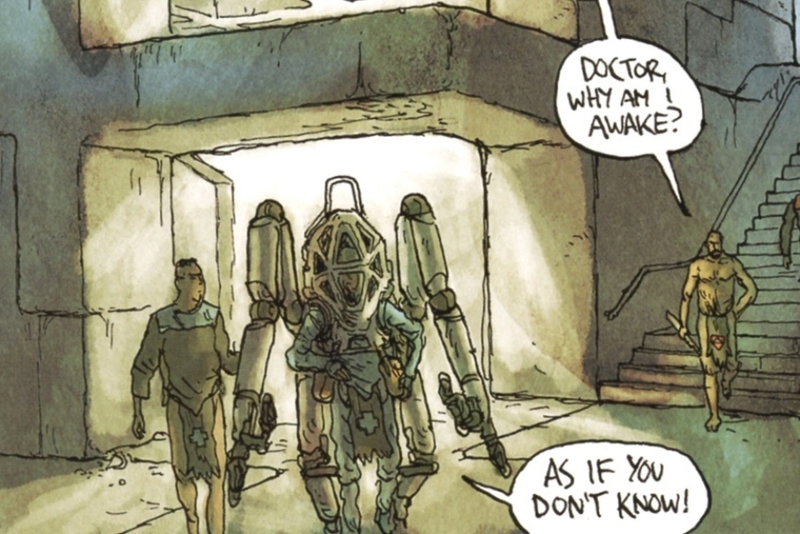 Soleri’s systems, with the ship’s higher ranking officials then deciding to cut off all communication with the posthumans — after which, the Euhumanist’s closed-society and the biome of their space habitat collapses into chaos and ruin. In the opening splash page (Figure 1.1), we get our first look at some of the graphic identifying symbols, which are primarily composed of triangles in different arrangements. 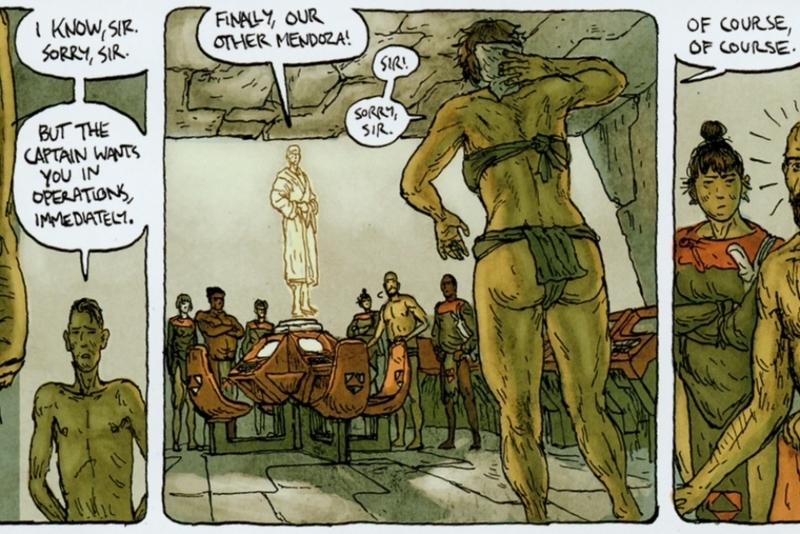 In the large fresco, a disfigured portrait bears a specific variation on his uniform, imagined by Simon Roy as “a primordial dictator, or some other grand, mythical leader.” The two figures below hold a flag featuring a more complicated symbol, and at their feet, one we’ll see used many times throughout the story. 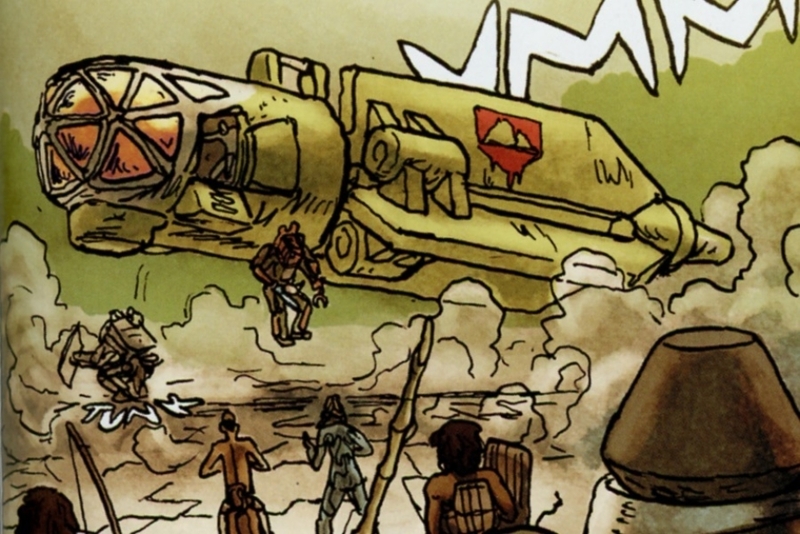 Not all of the symbols we find are defined in clear terms, but those that are reinforce the identities of the warring crew sections, and what elements of the ship and its operations are under their command and control. In the sections that follow, I’ll call out where various symbols appear in the story. And in closing, I’ll analyze the marks and examine their design in a broader context. 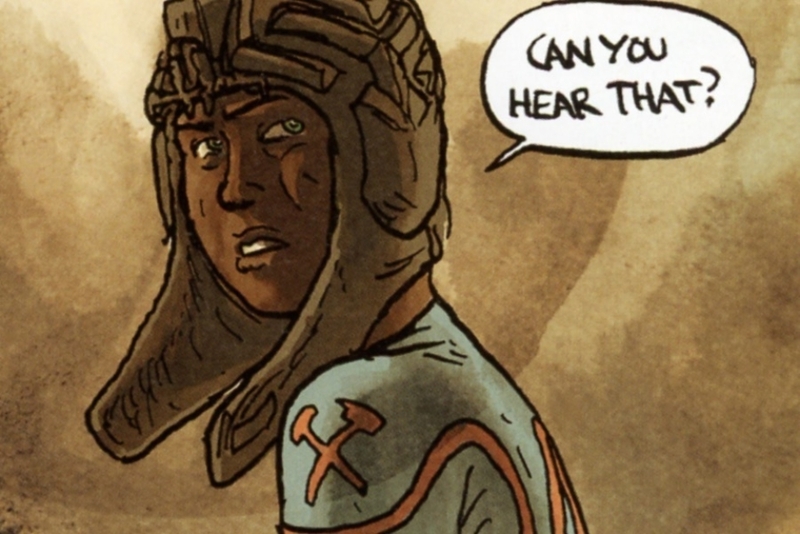 A big thanks to Habitat's creator, Simon Roy, for answering my questions and sharing insights into his inspiration and thinking for the marks we see in the story. 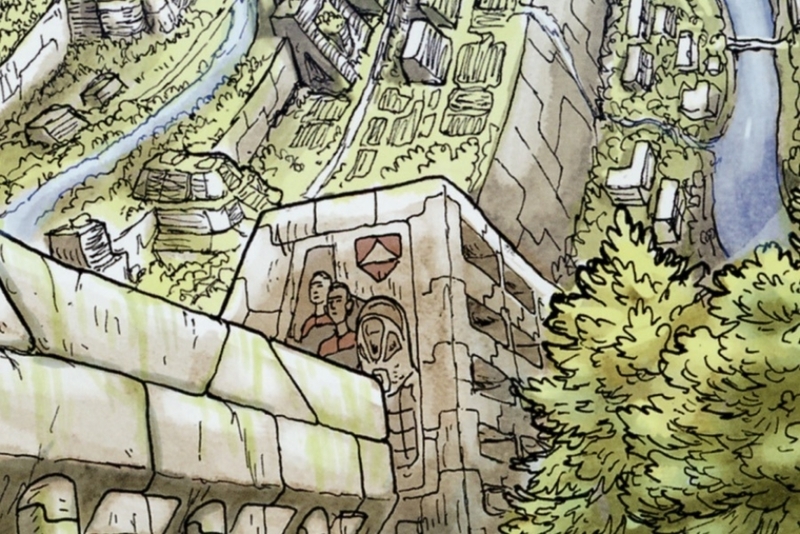 Figure 1.1 On the first page of Habitat, we see several variations of Euhumanist symbols in a damaged fresco. 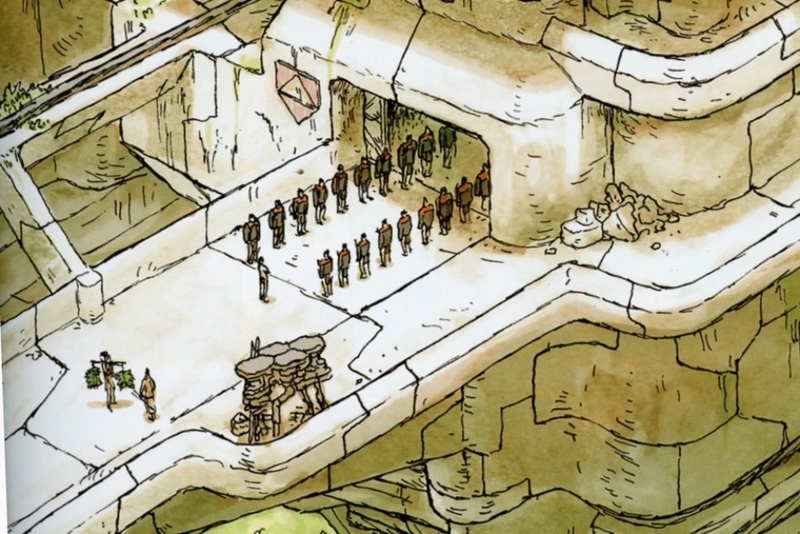 Figure 2.1 Early in the story, as Cho enters his initiation, we see the red-orange Habsec symbol on the side of the structure (left of the door). Figure 2.2 As we see with Cho, the Habsec symbol is worn by many of its members on the front of a loincloth. They also identify as red shirts. Figure 2.3 For Cho to accept his initiation into Habsec, the ritual requires him to grasp a freshly printed hot blade that will be his weapon. The Habsec symbol can be seen on the top of the 3D printer. 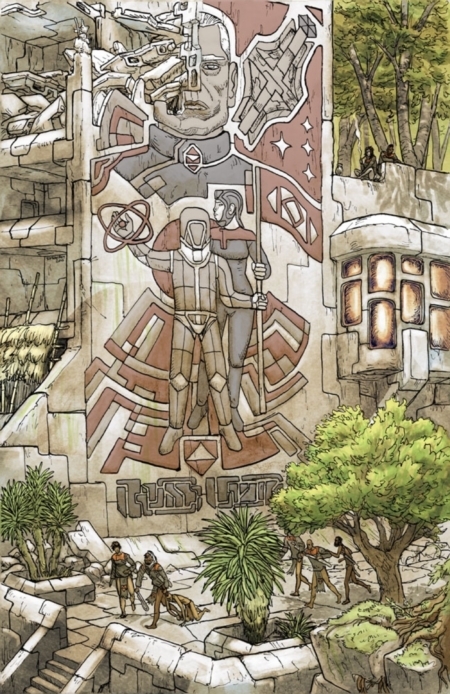 Figure 2.4 In a splash page that shows the massive interior of the ship’s habitat, we see another fresco on one of the structures. 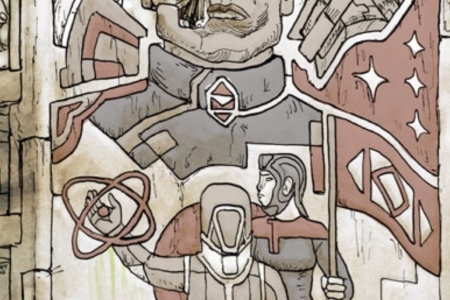 It depicts three red shirts — one wearing a pressure suit — with the Habsec symbol above. 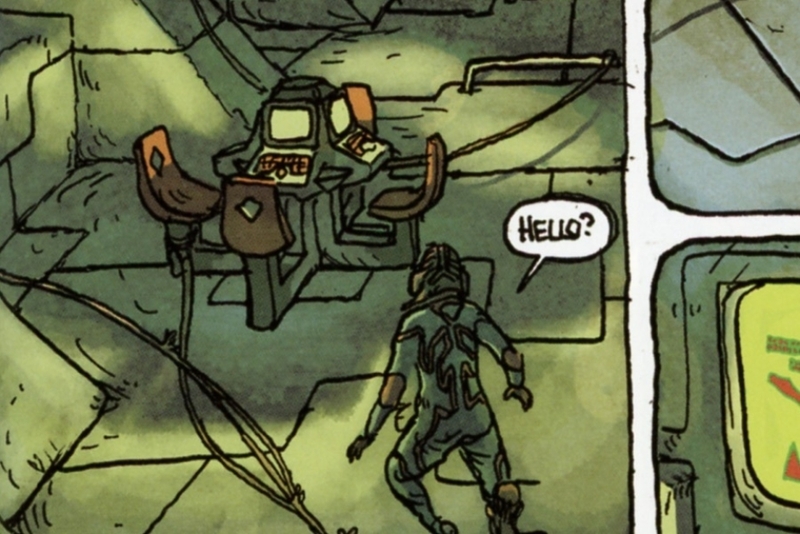 Figure 2.5 When the Habsec command convenes to discuss Cho’s escape with the phaser, we see their symbol knocked out of the backs of orange chairs, arrayed around the comms console. 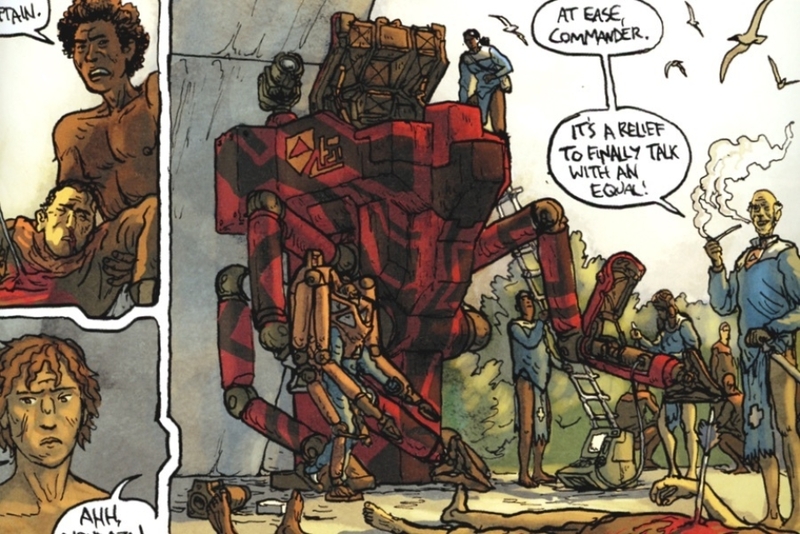 Figure 2.6 When Habsec catches up to Joan and Cho, they arrive in a captured Engineering “Observer” craft, on the side of which they've painted the Habsec symbol. Figure 2.7 As additional troopers arrive on the scene, we see that they bear the Habsec symbol on their riot shields. 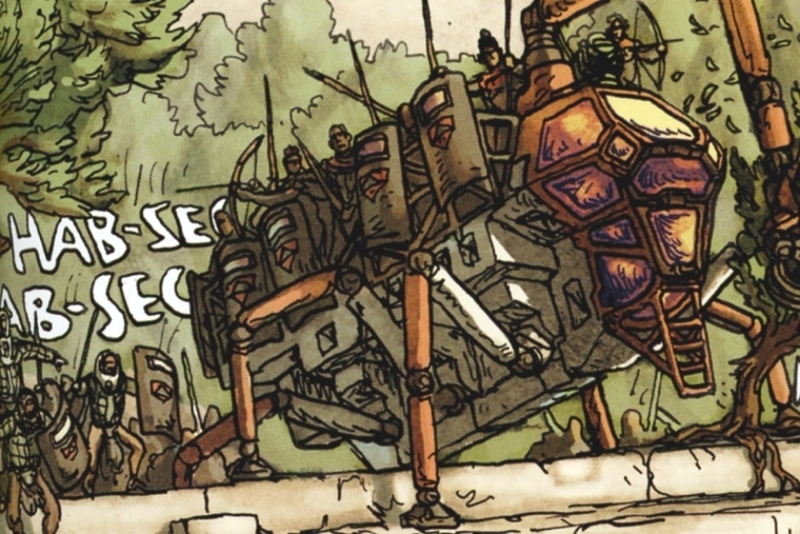 Figure 2.8 On the side of the red and black Habsec “warbody” we find the crew section symbol in orange. Figure 2.9 Captain Eneko, in his role as Habsec Commander, wears the symbol on collar pins and an officer’s gorget that hangs around his neck. Figure 2.10 In Simon Roy’s sketches and preliminary drawings, we get a good look at how the Habsec symbol is worn by troopers. Figure 3.1 After the emergency measures, Habsec found an ally in the Medical crew section. 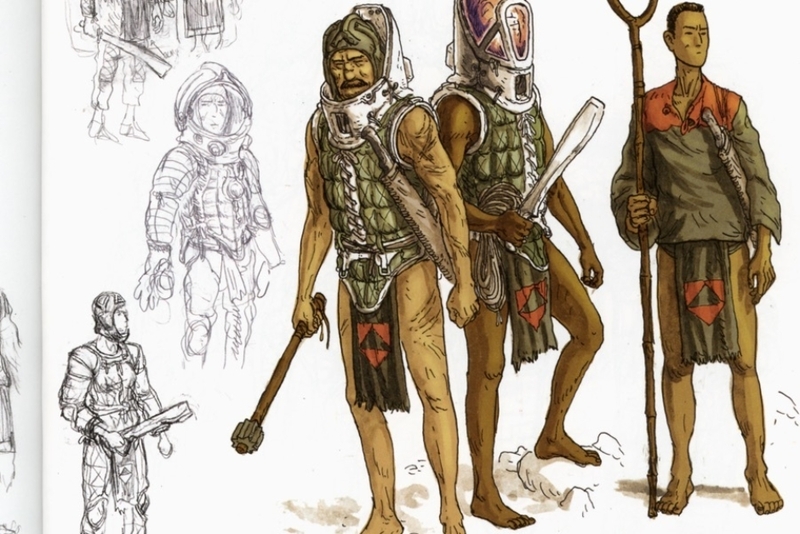 Their symbol is a medical cross, worn on their loincloths in a similar fashion to the Habsec. 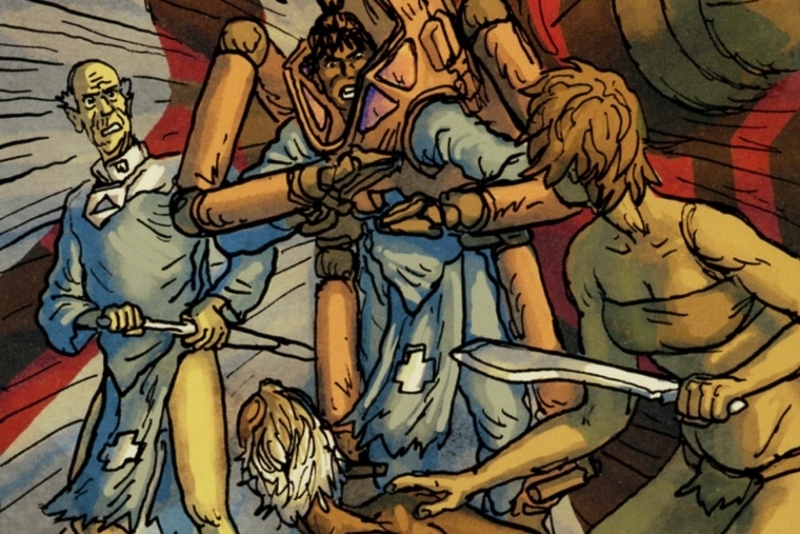 Figure 3.2 Medical crew also wore blue uniforms, which we can see here in the erupting clash between Captain Eneko and Mendoza. We also get a better look at the medical cross they wear. Figure 4.1 Engineering crew have retained a more civilized appearance, with their uniforms still worn intact. They appear in two variations — red and blue or green and blue. It is not clear what this signifies. Figure 4.2 On the shoulders of senior Engineering crew, we see their symbol is a diamond, which appears in red or green depending upon the uniform colors. 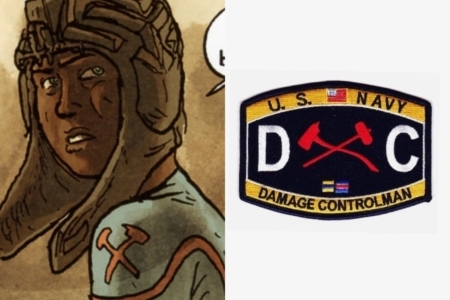 Figure 4.3 Joan wears a different symbol on her uniform, an Engineer’s axe and hammer, which identifies her role as Damage Control. Figure 4.4 In the area of the ship held by Engineers, we see the diamond-shaped Engineering symbol knocked out of chair backs. 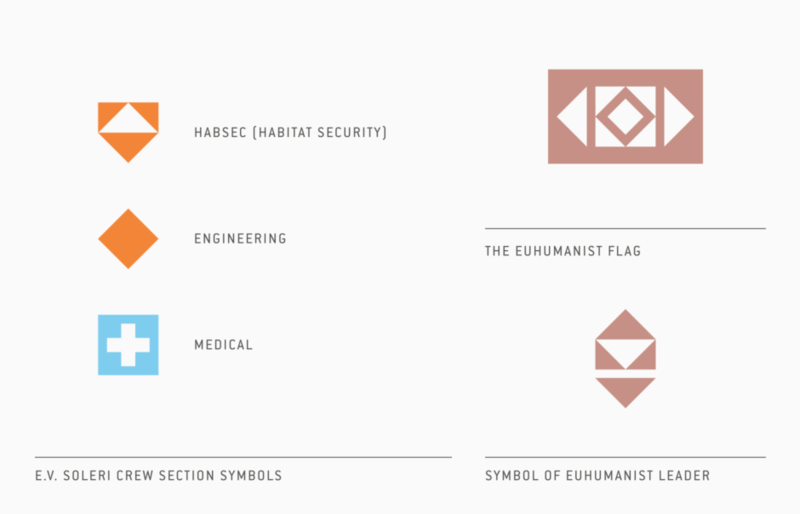 As I mentioned in the intro to this research entry, Habitat contains an implied system of symbols, defining the role and rank of Euhumanist crew aboard the E.V. Soleri. Of these, there are three that we can identify with specific crew sections. 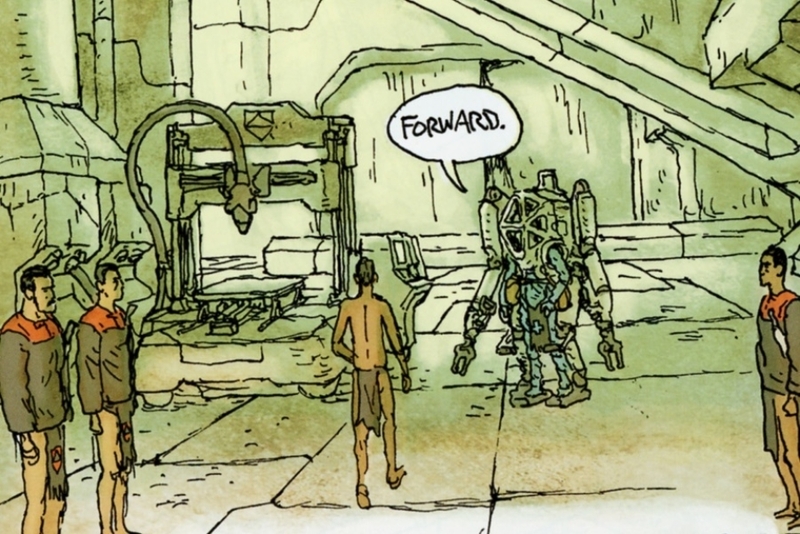 Two of them, we can see in Simon’s sketches that are found in the back of the trade paperback (Figure 5.1), for Habsec (far left) and Engineering (far right). The other is the symbol for Medical crew, which is a traditional medical cross. In my discussion with Simon, he noted that not all of the symbols and their specifics were worked out, so some of what we find in the story and sketches went undefined. The construction of the symbols relies on basic geometry, being mostly composed of triangles and squares. In some instances it is almost a modular system, especially in the case of the Habsec and Engineering marks, where one or the other symbol could be achieved by reconfiguring four isosceles right-angled triangles. 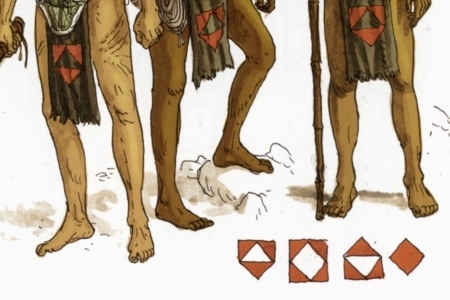 It gives them a technological or mechanical quality, and as we see with the resulting symbol for Habsec, this provides some interesting contrast, to see a modern geometric mark worn on a space barbarian’s loincloth. From a design perspective, it implies that there was previously a clean and controlled order to things before their society was broken — the mark being an artifact of their prior utopia. We see similar geometry in the flag that appears on the fresco (Figure 1.1), and again in the terminal screen of the ansible (Figure 5.2). One thing that comes to mind for me, in seeing the various configurations of shapes that form symbols within the Euhumanist visual identity system, are the fields and subdivisions found on heraldic shields (Figure 5.3). If you consider what is accomplished within the constraints of heraldry, it's a little easier to see how a multitude of marks and meanings could be assembled within the Euhumanist system, going beyond even what we’ve seen in Habitat. In addition to their abstract geometric symbols, we also see figurative marks in a few places, specifying specialized roles or ratings within a crew section. 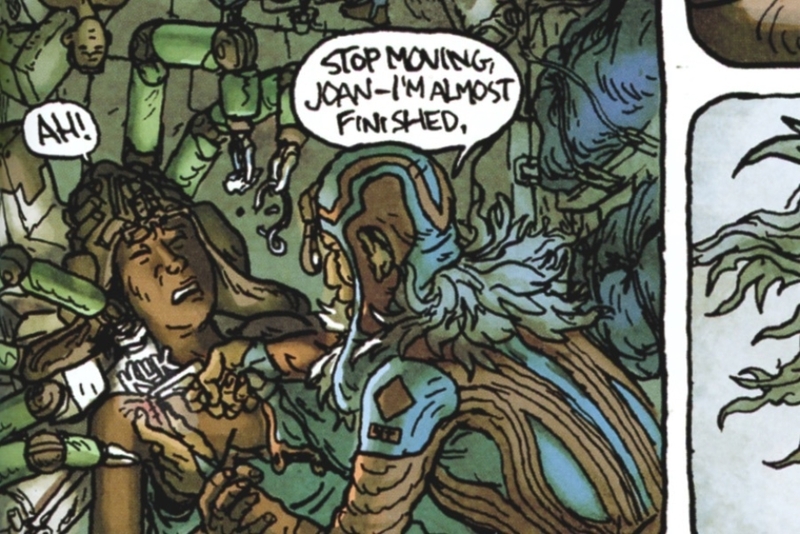 For instance, Joan from Engineering wears an insignia comprised of a crossed axe and hammer, which denotes her “Damage Control” rating. Aboard the E.V. Soleri, Damage Control repairs and maintains the super structure of the ship and its habitat, with the aid of robots. And as Simon Roy explained, their symbol is something he derived from that of the US Navy’s Damage Controlman (Figure 5.4), who are trained as maintenance and emergency repair specialists. In that context, the axe was originally a symbol used for the insignia of Navy Fire Fighters, Carpenters and Painters — ratings that were consolidated in the Damage Controlman in 1948. The hammer was used by Ship Fitters and Metalsmiths. 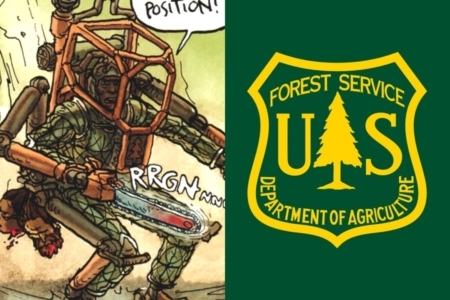 We also see a habitat Forestry symbol in the form of a tree, geometrically rendered on the chest plate of chainsaw equipped exoskeletons worn into battle by some members of Habsec (Figure 5.5). The pine tree is a common symbol for government-run forestry services in the US, and with the symbols being worn on uniform patches and applied to official vehicles at present, it makes sense that such a symbol would appear on future equipment like the forestry exoskeletons that appear in the story. 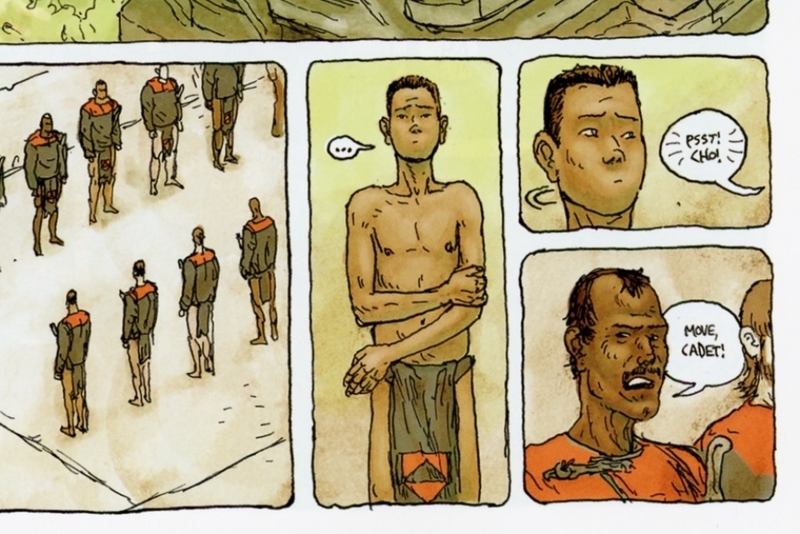 Altogether, nothing about the Euhumanist visual identity feels out of place or disconnected, and its symbols successfully hint at and reinforce what we learn from the characters about the previous order that was disrupted by the vessel’s disastrous state of emergency. Figure 5.1 Sketches show four symbols, obtainable from a modular geometric system that rearranges triangles to achieve the mark. 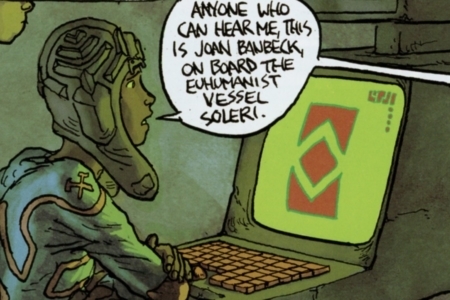 Figure 5.2 Where we see Joan using the ansible to communicate with the posthumans, we see symbols built on familiar geometry. Figure 5.3 Left: From Hornung’s Handbook of Designs and Devices, examples of the shield and its subdivisions. 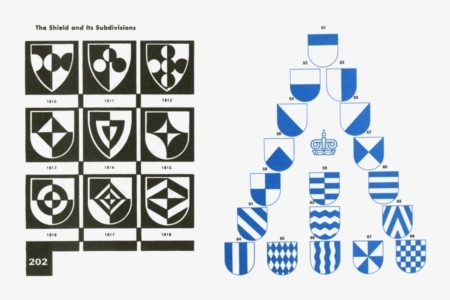 Right: From Metzig’s Heraldry for the Designer, examples of fields and ordinaries. 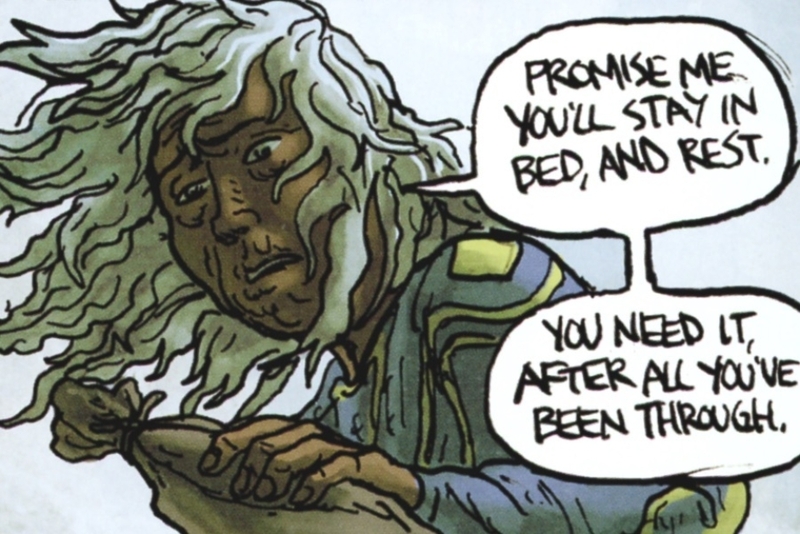 All images used under this entry without the source explicitly listed are excerpted from Simon Roy's comic Habitat published in trade paperback by Image Comics in 2016.